Policemen all over the world are often respected and placed on high pedestals seeing as they are charged with maintaining peace and order in the society. However, in a few countries, some policemen have caused harm to the people they were supposed to protect and this has causes some level of fear for them. 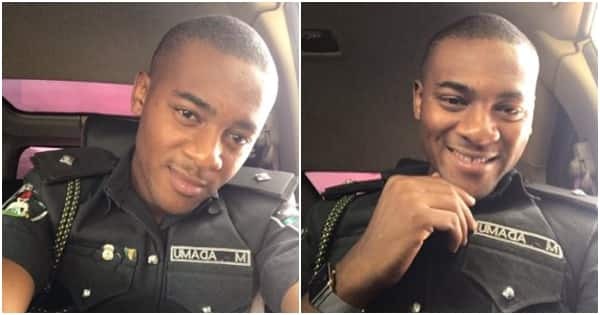 A good looking Nigerian police officer, MuktharAdamu, recently took to social media to try and douse the tension and reassure people as he explained that policemen are friends of the citizens. However, the officer did nothing to douse his high number of internet admirers who were carried away by his good looks. A number of people were more focused on his good looks rather than his message. The officer was looking cute in his clean and crisp uniform as his lovely smile melted many hearts. His gap-tooth also did nothing to discourage his fans. Legit.ng has gathered some interesting reactions to photos of Adamu, who is undoubtedly one of the most handsome police officers around. This young man who hails from the southeastern part of Nigeria is building a strong profile for himself on social media as a celebrity policeman. His lifestyle and personality goes beyond the routine tasks of cuffing criminals, looking for road defaulters or taking statements from victims of robberies and the likes. Opara lives larger than that. Not only does he visit and explore places beyond the jurisdiction of police duties, he also makes the police job look so good with the way he wears his police uniforms.